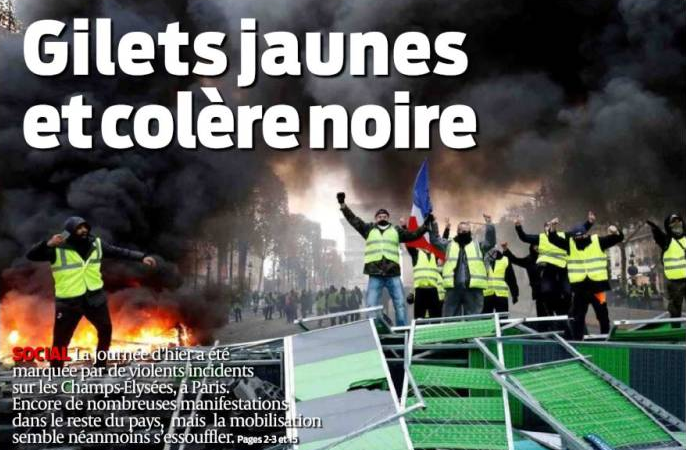 French media clearly had only one thing on their mind this Sunday as the Paris riots of yesterday topped all front pages. Calls in editorials for President Macron to act, appease or even turn back the tax increases that are being protested are heightening. Meanwhile, the violence and rioting seems to spread northwards as the Belgian city of Charleroi was plagued by Molotov cocktails and gangs throwing rocks at police forces for the third night in a row. Yesterday in Paris, rioters mixed among the protesters, draping themselves in the known ‘yellow vests’ (gilets jaunes) as if they are part of the movement and started throwing stones to riot police in images that went around the world. Related coverage: <a href="https://thegoldwater.com/news/43152-Paris-Riots-Government-Hundreds-Of-Far-Right-Extremists-Attacking-Police-Video"> Paris Riots – Government: Hundreds Of Far-Right Extremists Attacking Police (Video)</a>. 130 people were arrested as 8,000 protesters could be seen squaring up against 5,000 Parisian riot police. A burning Champs Elysées was shown on newscasts worldwide as the protest movement aimed against Mr Macron’s government has now persisted for 8 days. Although political commentators of the French government stated that at least there were fewer protesters than last Saturday this time round, the anger seems to spread. In the evening, President Macron, who has refused to comment on the protest movement all week, sent out a tweet saying: "Thanks to our security forces for their courage and professionalism. Shame on those who attacked them. Shame on those who used violence against other citizens and journalists. Shame on those who tried to intimidate elected people. There is no place for this kind of violence in the Republic." Protesters accused the French President of being ‘elitist’ and said their movement was about more than just the taxes on fuel. Many of them say they are having trouble making ends meet even with a job in France and feel that the President they elected almost a year ago was a mistake. His rival for the presidential election last years, Ms Marine Le Pen of the Rassemblement National is surging in the polls. Over in neighboring Belgium, the southern city of Charleroi saw a third night of rioting where the protests have by now moved away from the highways and fuel depots and are now located in the middle of the city center. Mr David Quinaux, spokesperson for the Charleroi police, spoke of city guerilla actions and said that the protesters could be seen lighting fires, throwing rocks and Molotov cocktails. Around 9.30 pm yesterday evening the police stormed a group of 150 people who had gathered at Square Jules Hiernaux and set fire to some barricades. The crowd was then driven apart by the water cannon. At around 11 pm there were still about a hundred people in the area. Mr Quinaux said they tried to confront the police in small groups. Just like the previous nights, there was vandalism to street furniture and advertising panels. Several windows of shops were broken. There were only 200 'trouble makers' and 9000 police. yet, the police could not control the street. I wonder what they would do if faced by 20-30000 violent people (Israel-Gaza border) ? Serves them right for believing the state run corporate owned media that told them Le Pen Bad. You elected him, you deal with the ramifications. Don't get buyers remorse now. About time the French had enough of that POS! …and he was laughing at President Trump. Maybe should have been worrying about his own country. HEY MACARONI… NO SLEEP FOR YOU!!! NOT ONE WINK!!!!!! !